Lachie's House has 3 bedrooms & 3 bathrooms & has been finished to a very high standard. On the ground floor there is twin room, an en-suite double room with king size bed, bathroom with a bath and shower cubicle. A fully equipped kitchen with large oak table, fridge freezer, washing machine, dishwasher microwave & coffee maker & a large gas hob and double electric oven. The lounge is also on the ground floor with magnificent views of the famous Quiraing Mountain, with a flat screen tv, dvd/cd player, i-pod dock, & log burning stove, (logs provided), upstairs is another en-suite double room with a king size bed. We provide a Free Starter Continental Breakfast pack plus all basic groceries, including kitchen roll, toilet roll, all cleaning materials and cloths plus a selection of toiletries. A full list will be provided in an information e-mail provided 7 days prior to your stay. Ample parking. A great base for touring the Island. A warm welcome awaits. There are no rooms available at Lachie's House for these dates. Welcome goodies were great, host lovely, very comfortable, everything you would want to cook with, a kitchen delight really. A little out of the way, but beautiful setting. With no dryer, washing and drying is a problem. Thank you Bea for your review of Lachie's House. 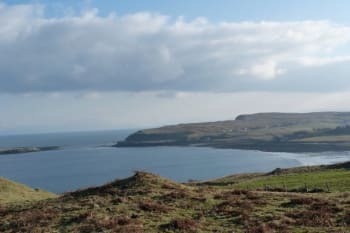 In reply to 'Tips for other travellers' Lachie's House is not advertised as being in the centre of a 'Hub' but is situated in Staffin, one of the most beautiful areas of Skye with fantastic views of the famous Quiraing Mountain and is an ideal base for touring the rest of the Isle of Skye. We have a hotel, 2 food shops, restaurants,craft shops a lovely tea room, beach, complete with dinosaur footprints, famous landmarks etc etc all less than 5 mins drive away from the House. We don't provide a tumble dryer in Lachie's House as it is not a necessity as there are alternatives available, there is a washing line and clothes pegs for drying washing outside, a clothes airier for drying washing inside and as per the information sent to all guests before arrival we have a fantastic laundry at Staffin Stores also less than 5 mins drive from Lachie's House where you can dry a large load of washing very quickly for a very reasonable price while you enjoy a coffee or a trip to Staffin Beach to look for the dinosaur footprints, you don't have to sit and watch your washing dry you just come back when it's finished. Very nice, clean, modern and convenient house. Fantastic surroundings and landscapes. Very friendly staff. We had a wonderful stay there. 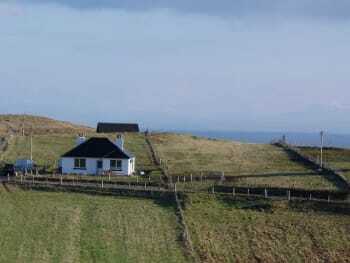 Beautiful croft cottage in a wonderful location. Every little detail that was put into the house made it feel like a home away from home but even better! I was pleasantly surprised to find a large bath tub in the house. This was appreciated along with the laundry facilities, music docking station, wood stove (with wood and fire starter provided) and beautiful, well-equipt kitchen. Mairi and her husband are lovely people, so welcoming and down to earth with heaps of helpful info about the Isle of Skye. Couldn't have asked for better accommodation in this truly special place. Single Track makes great coffee (about 7 minutes away). Edinbane Inn had awesome live traditional folk music (about an hour away). There is also a lovely weaving studio which serves light lunches called the Ellishadder Gallery (about 7 minutes away). Absolutely fantastic stay at Lachie's House. Perfect location to get away from it all. Very close to all the "must see" sights in Skye. The house was wonderful, clean, comfortable and spacious. Great views of the Quiraing. Mairi was a wonderful host and her recommendations were spot on. Family could not have asked for a better stay. The Quiraing, Old Man of Storr, Brother's Point, Duntlum Castle, Fairy Glen all close by. The Ferry Inn restaurant in Uig was fantastic! 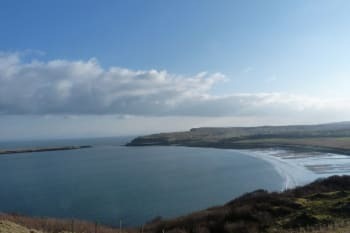 The house is located in one of the most beautiful parts of Skye with dramatic hikes and vistas very close. The house itself is very comfortable with nice modern kitchen and bathrooms. Mairi is amazing, incredibly welcoming and helpful. She even took my laundry off the line and folded it! We would definitely go back, hopefully for an extended stay. A lovely cozy house with everything we could possibly need. My family loved it! Two shops, locally, and some eating places not so far away. Lots of beautiful places to visit! Lachie's House exceeded all expectations. Mairi was very kind and helpful and made sure we had all we needed, including a well provisioned kitchen with all breakfast basics. The cottage was picture perfect! Clean, modern, and comfortable. Mairi was delightful and spent time to recommend walks, restaurants and amenities in the area. Her maps were spot on. We will always remember our time in this magical place on Skye, with the spectacular views. Dunvagen castle, The Oyster shed and Talisker distillery make for a fabulous day. All walks near the north west end are spectacular. The museum provides great insight into daily life on the island in years past. Lachie's house is fantastic. We had the most amazing time staying here. The house is finished to such a high standard. The location is beautiful and close to many of the 'must see' sights in Skye. The hosts left us milk, bread, juice, breakfast items, soaps and shampoos which was such a nice touch. I have already recommended this accommodation to numerous people on my return home. We had such a memorable trip and can't wait to come back to Lachie's house one day in the future. The faerie glen is amazing. Definitely worth a visit. Visit the lighthouse in Dunvagen on a clear day. Portree has lots of nice shops. We enjoyed meeting Maira. She keeps the house in perfect shape and gave us good recommendations. We appreciated hearing the house's story. This house is well situated to explore the northern area of Skye, and we explored a good deal of the island from there. We had a wonderful stay at Lachie's House. The accommodation was fantastic, all finished to a high standard and had everything we needed. The location was great - remote - but that's what we were looking for on Skye. Mairi was very helpful and welcoming and a mine of local information. We had a fantastic week and would thoroughly recommend it. Lachie's House ist ein wirklich wunderschönes Ferienhaus mit einer wunderbaren, sehr hilfsbereiten Vermieterin. Sehr empfehlenswert. Lachie's house is really near to Quiring. The landscape is so amazing, to bring something to eat and drink is a good idea. Absolutely beautiful place in a stunning location. Clean, and homely with all the mod cons. All round really special and peaceful place. It was a very nice place to be.The house was excelent. Back again! We've had the pleasure of staying at Lachie's House two years in a row. We brought my parents with us this year because we just had to share the experience with them. We had 6 people in our party and the house was a perfect fit. Plenty of space for us and with three bedrooms and three washrooms we all had privacy and getting ready in the mornings and everyone needing showers/baths in the evenings was never a problem. The kitchen is fully stocked and all the appliances still look brand new. The house is extremely clean and has been very well maintained over the last two years. I can't recommend Lachie's House enough! The location is fantastic as well. Very close to lots of beautiful walks like hiking to the Old Man of Storr, and the Quiraing. I hope that we will be able to return again to Lachie's House! Thank you Mairi for another magical visit to Skye!! My wife, 8 year old daughter and I had a really lovely stay at Lachie's House and received a very warm welcome from Mairi. The house was incredibly comfortable and well equipped in every way and we really appreciated Mairi adding so many useful food and kitchen extras not normally included. We'll be coming again and highly recommend Lachie's view. So much and Mairi supplies a lot of useful print outs of walks and local information. Wet days - Dunvegan, Aros, Talisker Dry days - Quirang, Fairy Pools, Elgol & Loch Coruisk, Fairy Glen, Neist Point. Advice from Mairi on places to visit. Was very helpful. Lachie's house facilities are all above standard with excellent condition.Despite it far from the town center like Portree,This house will be one of the best for traveling base in Isle of Skye. Thanks so much to Mairi for her kind hospitality. We will return back to stay in Lachie's house again. Strongly recommend. Prepare to buy your groceries from Co-op in Portree before arrive to the house. We were absolutely delighted with our stay at Lachie's House, everything was warm and comfortable and scrupulously clean - such a welcoming destination after a long journey! Mairi was fantastic, even popping over to let us know that we would be able to see the Northern Lights from Staffin Beach. I wouldn't hesitate to recommend the cottage to anyone visiting Skye. We had a great time at your house! I can recommend this fully to anyone who enjoys peace and quiet days on the most beautiful Isle of Skye. I can't wait to come back! Thank you very much! lovely, well-equipped newly innovated house, outstanding location and incredible view from the backyard! recommended for those who want to stay in authentic Skye nature between mountains and sea. Sunrise is must to see! We were amazed at the extraordinary location of the house as well as the views of Quairang. The house was very comfortable and clean. We enjoyed the pie place just to the south. It has been like spending 2 days in paradise. Everything has been perfect. If there is something I have clear now is that I want to come back to Skye, and it definitely wish to stay at Lachie's House. Probably the best Place to Stay on Skye! Lachie's House was so lovely arranged und very modern designed. The Location not far from Portree is buityfull with a lot of Nature Highlights. Everytime again. One of the best locations on Skye. The front faces a lush green mountain slope with sparse houses, and the back faces an open green backyard that ends on the shore. Beautifully decorated house. If you have a car, then this place is close to Old Man of Storr, Quiraing, and Kilt Rock. There is a convenience store and a good restaurant (1400 Columba) close by. Lots to see and do. The folk museum, The Quiraing, Dunvegan Castle, Staffin Bay, The Coral Beach, The Fairy Pools, Talisker. The list is endless and none disappointing. The fact that you have to travel to see these things is not an issue. There's lots of crafts and galleries everywhere to in Teresa you. Very friendly people. They welcomed us and were incredibly kind. The house is really beautiful and cleaned. It is beautifully decorated with attention to details and equipped with everything. The beauty of the landscape is priceless. We were even able to see the aurora borealis! Don't go to the floddygarry hotel. Unless you like steak and fish. And have a platinum credit card for a lamb chop. We thoroughly enjoyed our visit to Skye and Lachie's House was a great hub for our family. The house is absolutely beautiful with a gorgeous view from the picture window in the sitting room. A perfect spot in front of the fire with a cup of coffee. Such a beauty to wake up to each morning! We were close to so many places we wanted to explore and Mairi had loads of helpful maps and info to help us choose our activities. There is a small grocery just down the road with a restaurant just beside it for a sit down meal also there's a great take-away called MacKenzie's that's is also very close. If you want to cook, Lachie's House has everything you'd need with double ovens, a five burner stove, microwave and all the utensils and pots/pans/mixing bowls etc. We hope to be able to return to Lachie's House for another holiday in Skye! Just a wonderful place to stay! Get groceries before heading to Skye as not a lot around to buy but plenty of places to eat out. Outstanding accommodation with a room kitchen diner and a very warm & comfortable living room with a log fire and a stunning view of the mountains. Lovely, cosy house. Absolutely recommend it to visit to anybody ! A very comfortable well-appointed house in a peaceful spot amidst incredible scenery. The information provided at the house was very useful. Exceptional accommodation. Lachie's House is extremely clean and very comfortable. We were provided with groceries for breakfast as well as all necessary toiletries and cleaning supplies. We travelled with our 2 young children and felt "at home". Mairi is also a very helpful host and was at our disposable during our stay. We highly recommend Lachie's House. Very helpful and friendly and a great location for exploring the north of the island. The house is beautifully presented.